Do you have plans of studying abroad? Here is a great news for you! The Study International Education Fair 2013 gives you the perfect opportunity to ask Representatives from selected overseas educational institutions from Australia, Canada, Malaysia, Singapore, New Zealand, the UK, and the US. Alongside with the event participants are the the exhibition of partner organizations – British Council, Canadian Trade Commissioner Service and Education Malaysia. The fair offers the most affordable and accessible options for you to study abroad. Through the school representatives that are present during the event, attendees can be provided with first-hand information on how to go about with their study plans abroad. From the various study opportunities available, to the application process, the various courses and opportunities available, as well as costs for living and tuition. 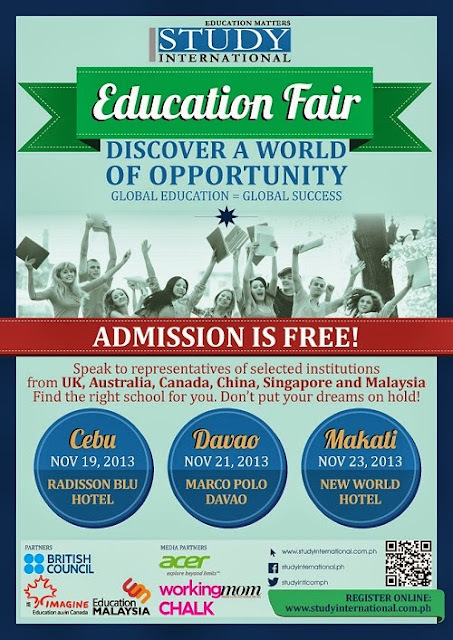 The Study International Education Fair 2013 is FREE and will be staged in three cities. You can register online at www.studyinternational.ph or like them on Facebook for more information.